Zu Beginn des neuen Jahres ist der Gewinner des 100˚ Jurypreises der Sophiensaele in den Cammerspielen zu Gast, um in einer fulminanten Solo-Theaterperformance die Liebe und den Herzschmerz zu feiern. 1885 stürzt sich Sarah Henley von einer Brücke. Sie lebt. Heute spricht sie über diesen Vorfall und über andere Dinge, die uns an unsere Grenzen treiben. Dabei geht es nicht um Selbstmord, sondern um Liebe und was wir bereit sind für sie zu tun. Inspiriert von realen Erzählungen unglücklicher Liebe – manche gegeben, manche gefunden, manche gestohlen – ist diese Performance ein Akt der öffentlichen Selbsthilfe, des Aufstehens, des clownesken Abarbeitens und des poetischen Mäanderns um unsere scheinbar endlose Auseinandersetzung mit diesem pumpenden Organ namens Herz. Stets mit einem Bein im Fettnäpfchen stehend und mit 180-Grad-Wendung direkt in absurdestes Melodrama schlitternd, reflektiert „I Gave Him an Orchid“ die Schönheit und Hässlichkeit der Liebe und des Liebeskummers und lädt das Publikum ein, seine eigenen Geschichten und Wünsche zu teilen – ein Fest der Liebe, des Liebeskummers und des Lebens! In 1885 Sarah Henley throws herself off a Bridge. She lives. Today Sarah talks about it and other things that push us over the edge. It is not about suicide, it’s about love and what it makes us do. Inspired by real heartbreak stories – some given, some found, some stolen – this is an act of public self-help, stand up, clowning and poetic meanderings around our seemingly perpetual preoccupation with this pumping organ. Bouncing happily along the boundary of inappropriateness, u-turning into absurdist melodrama and reflecting on the beauty and ugliness of love and lovesickness and inviting the audience to share their own tales and desires, I Gave Him an Orchid is ultimately a celebration of love, heartbreak and life. Flight of the Escales are makers of experimental original theatre and performance, deconstructing forms and relationships in an attempt to get to the bones of a topic and to turn the status quo on its head. We are interested in exploring the unseen: the ugly and unpolished, the characters without a voice, the lesser explored perspectives. 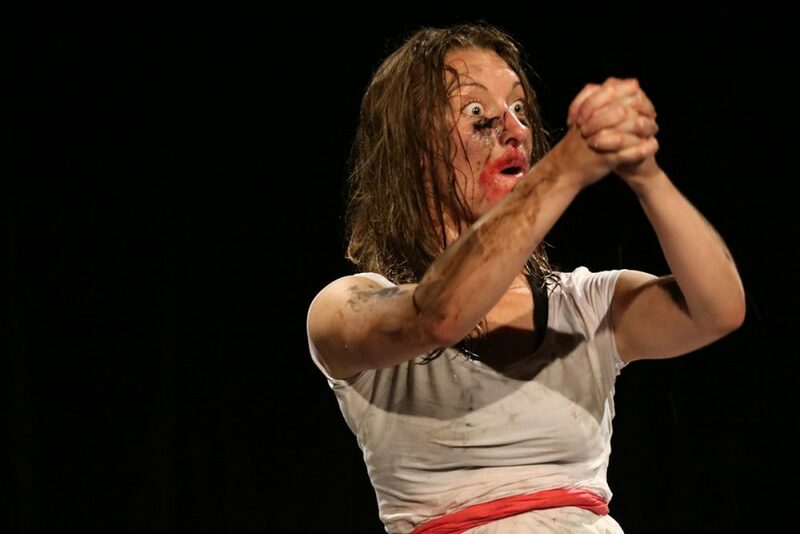 Our performances are a mash up of dark comedy and absurd surrealism, a mix of poetic meanderings and uncomfortable truths as we explore what it is to be us, now, then. Flight is not limited to a specific way of creating and developing work – instead we continue on our collective and individual routes of exploration, being curious about people and the world and facing each new project with an inquisitive body and mind. We are associate artists at The Cut with projects supported by The Roundhouse, Jacksons Lane Theatre, Cambridge Junction and Sophiensaele. Our work has been seen in the UK, Germany, Poland, Croatia, Czech Republic and Spain and programmed in festivals including Kana, Prague Fringe, Edinburgh Fringe, 100˚, Pulse and Faki.